For this project, we (Team 17 of the LFS 350 course at UBC) partnered with the Gordon Neighbourhood House (GNH) in the Downtown West Side of Vancouver to develop a ‘toolkit’ that will assist GNH in the expansion of their Herb Garden project into a network of community gardens. In order to enhance understanding of the project, we conducted a perception study to gauge the perspectives of both GNH and members of the greater community. Our research focused on the question: What is the perceived role of an herb garden to the stakeholders and participants in this study? To gather all these perspectives, we interviewed staff at GNH, those directly involved with the herb garden at 1075 Burnaby Street, and conversed with community members at the ‘InFARMation’ event hosted at GNH. We conducted informal interviews through discussions about herb gardens in order to gather opinions rather than relying on questions and answers. Conversations were then analyzed and coded to determine the key themes and values communicated by the interviewees. We found that generally, the perceptions of GNH and the expectations of the community aligned. Staff members at GNH wanted to supply free herbs, although individual reasons for doing so differed. Community members wanted access to free herbs and a space to grow them. However, we observed that the owner of the herb garden carried a different set of expectations than those working at GNH. As a property manager, the landowner built this herb garden with the expectation that it would create social space for tenants and foster a connection between people and their food, regardless of the garden’s production. From our research, we conclude that there is a need for clear and community-appropriate communication. The unique nature of an herb garden requires users to be informed through clear signage whenever possible. Prospective landowners also need to understand the communities’ perceptions and expectations from an herb garden. This will facilitate an understanding of the variety of roles in such a project and the empowerment to make community-appropriate changes. Essentially, we find that clear communication is necessary at all levels of this project in order to ensure the expansion of this project to other communities. This project was performed by eight undergraduate students from the University of British Columbia. Our team partnered with a community service organization, the Gordon Neighbourhood House (GNH) in West Vancouver, and focused on the expansion of their Herb Garden Project. GNH strives to support their community by offering programs promoting development in leadership, education, and community engagement. The GNH herb garden project serves to improve food literacy, access, and equity by providing sustainably grown, fresh, and local foods to those in need. In particular, it aims to provide “a free, openly accessible place for members of our community to plant, grow and eat fresh herbs" (Andrew Christie, Personal Communication). A major goal of the herb garden is to enable community members to incorporate herbs in their recipes at home and to diversify food knowledge, attitudes and behaviour (Paul Taylor, Personal Communication). In order to encourage usage of herbs, people can take herbs freely from the garden without obligation to engage in social interactions. Previous research claims “community gardens are potentially very inclusive spaces and open to a range of social backgrounds” (Firth et al., 2011). In this capacity, community gardens can help to bring community members together and increase food access via environmentally, economically and socially sustainable means. Although there is much potential for social engagement, we noticed that the social aspect of the community garden was not emphasized in the GNH model. In fact, although the herb garden had some resemblance to a community garden, people interacted with it quite differently. Therefore, it was necessary to understand how people perceived its role in their community, rather than to measure its potential impacts. Throughout our research we explore the question: What is the perceived role of the community herb garden to various stakeholders and participants in this study? We conducted our project as a perceptions study. We gathered information on the Herb Garden from the perspectives of various stakeholders and community members. We were able to clarify the role of the herb garden within the community context, which will be of use during the expansion of the Herb Garden Project. The community herb garden developmental toolkit is the product of our research. It includes steps to establish a garden, information for financial support, as well as recommendations that are important for community oriented gardens. The purpose of the toolkit is to encourage clear objectives and knowledge when empowering potential garden developers. 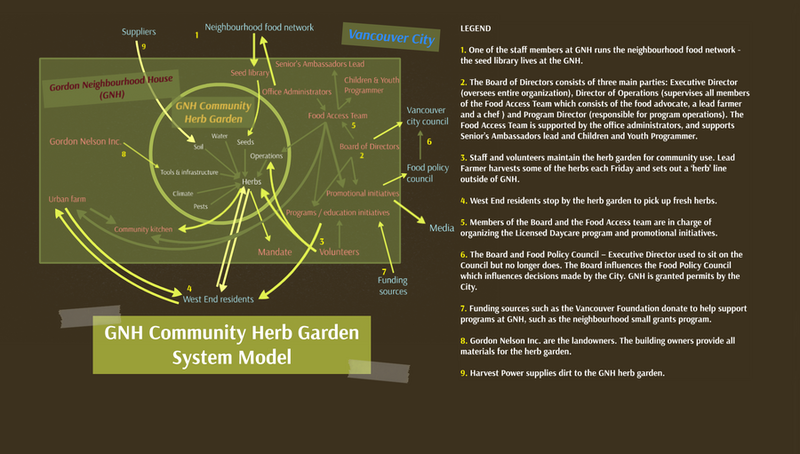 Many complex relationships exist between the GNH herb garden, GNH and Vancouver. A systems model is presented in form of a Prezi presentation to summarize these relationships (http://prezi.com/grfgtnikxp-0/?utm_campaign=share&utm_medium=copy). The arrowhead indicates the contributions to and from each resource. Brief explanations of selected relationships are recorded in the legend. Initially, we approached our research with a mixed methods design, where we intended to gather both quantitative and qualitative data. This was in line with our first interpretation of the project proposal provided to us by GNH, where we set out to research; “What is the herb garden’s impact on the community?” When we presented the idea of interviewing individual community members to our project partners, they recommended that such a method for data collection could potentially be invasive. We then shifted our mixed methods approach to one focused on qualitative data collection. This is more appropriate due to the small sampling size available for research. Additionally, we noticed that stakeholders had different ideas of the role and the expectations for the herb garden. It was also our own presumption that the herb garden was having an impact on the community in the first place. This initiated a significant evolution in the direction of our research. 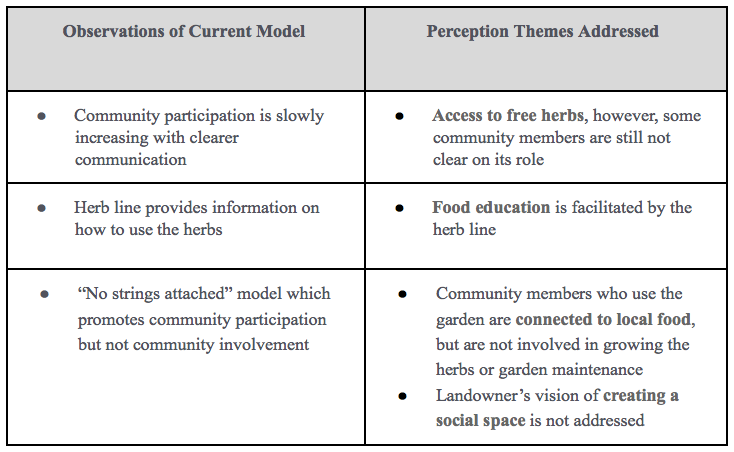 We shifted our approach from an impact study to a perception study; our intentions were to gain a general profile of what community members expect from an herb garden. Our methods focus on researching what people wanted from an herb garden, how they wanted to engage with the project and how these differing perspectives match up. Obtaining a clearer idea of what community members wanted from an herb garden would be more valuable information for GNH rather than simply analyzing their current system. Most, if not, all of the data was collected through interviews that were conducted with stakeholders and participating community members of this project. Consent for the interviews were given orally: interviewers asked if the interviewee’s responses could be recorded through a recording device, and the interviewees agreed. These interviews offered insight into the systems and processes of the GNH Herb Garden model and also aided in the creation of the Herb Garden Toolkit. Interviews with stakeholders were scheduled via email. Additionally, we posted a sign to solicit interviews with community members within a span of two weeks, but received no reply. Although simple random sampling is usually the preferred method of data collection, we classified this as convenience sampling as the interviews were held at a time which were convenient to us and our interviewees self-selected themselves based on their availability. For all data collected from interviews, we classified them according to preliminary codes. These codes were developed to enable us to examine the emergent themes and to further categorize more specific and applicable codes. These interviews provided us with the perspectives of select members of the community and stakeholders. As a result of the limited sample size and the fact that in most cases only one interview was performed, these perspectives were not intended to be representative of the population (Creswell, 2003). We cross-referenced information gathered from interviews with GNH and other participants to identify perception gaps. Based on the common themes and perceptions, we were able to develop specific recommendations. Interviews with three stakeholders from GNH were conducted, and codes which emerged from these interviews included: “access to herbs”, “philanthropy”, “food literacy”, “bringing people together” and “civic participation”. “Access to herbs” was a code identified in all three interviews, while “food literacy” and “bringing people together” were only identified in two of the interviews. “Civic participation” was only included in the code list for one of the interviews, and thus, was weighted less heavily than the other codes in the development of perception themes amongst the GNH stakeholders. Common perception themes between GNH stakeholders included the desire to provide the community with free herbs and to encourage food literacy through food education. A high level of community participation (1) to facilitate increased access to herbs and shifts in food behaviour was identified as the predominant goal behind the herb garden from the integrated analysis of the three interviews with GNH stakeholders. An interview was conducted with the property manager of Gordon Nelson Inc. to obtain an understanding of the landowner’s perception of the role of the GNH herb garden. Codes which emerged from this interview included: “creation of social space”, “connection to food” and “bringing people together”. Analysis of these codes led to the development of two themes: the desire to create a social space for the community, and the hope that the herb garden would aid in connecting community members to their food through direct involvement(2) with the garden. Ten community members were interviewed at the InFARMation event held at the Gordon Neighbourhood House. Two interviews were also conducted with project managers from Shifting Growth and the Edible Garden Project, which were categorized as community interviews, since both project managers are builders and users of community herb gardens. The following codes emerged from interviews with community members: “connection to food”, “bringing people together”, “cooking and herb use”, “food quality”, “food access” and “food education”. “Connection to food” was the most prevalent perception code between all interviewees, and thus was weighted more heavily in the development of themes. It was determined that the community held the expectation that an herb garden should provide access to growing space as well as a connection to food community participation (1) and involvement (2). It was also found that community members have a desire to incorporate herbs from herb gardens into their cooking. From both the interviews with stakeholders at the Gordon Neighbourhood House and community members at the InFARMation Night, the GNH’s idea of a herb garden’s role seems to mesh with the community’s. Both sides had a variety of motivations behind their goals for a garden, but they agreed on the basic fact that a herb garden should provide herbs and gardening space. However, the themes that we identified indicates a disconnect between the intended design of the herb garden and its perceived role. Community members wanted to personally grow and consume herbs, with few community members indicating that they expected to provide for their community or familiarize their community with herbs. This is not a surprising result. The GNH’s participatory herb garden model is rather different from the traditional community garden model that most interviewees were probably thinking of. We classify this as a fundamental gap in perception between what community members understand about community gardens and the GNH’s design of a community herb garden. Simply put, a perception gap is where a communicated intention is misunderstood by the target audience (Eales-White, 2004). This gap manifested itself at the InFARMation Night through community members’ misunderstanding of the GNH participatory garden model, but has also left its mark on other events. Susanna (Head Farmer at GNH) had reported initial reluctance from community members to take herbs from the garden, a fact that she attributed to the idea that community members felt as if they were stealing if they took from the garden. This could be from confusion due to lack of signage, but community members might have also fallen prey to the perception gap, perceiving the herb garden as a community garden owned by unseen gardeners and refusing to commit ‘theft’. This highlights the need for clear communication in this project. Without it, it is difficult to differentiate the GNH herb garden model from a community garden. We also identified divergent themes between Stephanie Nelson and GNH. The GNH staff had various motivations behind providing herbs, but agreed that the end product (providing herbs) was the most important part of the project. Stephanie, however, cared less about the end product and more about benefits created by its presence, like social space and connecting people to food. This highlights a key limitation to our study: small sample sizes. This was already an issue with community members, but there is only one current landowner to interview. While we were able to receive her feedback and understand her key values in an herb garden, her perspective may not hold true across all future landowners. Likewise, we cannot assume that all community members interviewed at the InFARMation Night will become herb garden landowners, nor that they represent all of the community’s perspectives. However, our collected responses are valuable in understanding the values that prospective herb garden builders may hold, such as the strong ‘connection to food’ theme that was present in most groups. We have drawn some recommendations with regards to implementing a community herb garden project. A community’s engagement with an herb garden is a function of the quality of communication around its role. We recommend that the signage and language used clearly communicates and reflects their intentions for the project, making sure to highlight the differences in this model. Secondly, there is an opportunity to reduce perception gaps by tailoring the design of an herb garden to suit the community context. A ‘community’ is not a homogenous group of people sharing the same perspectives and desires and thus herb gardens must be adaptable. This adaptability could be fostered through consultations with potential community participants, fostering a space for participants to share their opinions and expectations as well as informing them about the garden. Our third recommendation looks towards expansion through the integration of our first two recommendations. Herb garden construction using the toolkit may be fairly simple, but the process of planning a herb garden is a holistic process which draws heavily on the specific needs of the community and landowner. The toolkit can provide examples of clear communication, but we recommend that the GNH provide assistance to potential herb garden builders through email/in-person advice in order to encourage a more holistic approach to planning. Ultimately, a community herb garden gives an opportunity to engage the public towards increasing awareness on food system issues. The perception gaps noted in our findings suggest that a holistic approach needs to be accounted for when using the toolkit. Landowners must clearly express their intentions to community members and adapt to fit their expectations. With these recommendations in mind, future herb gardens may see more use and facilitate their food system goals more effectively. Christie, A. (Community Food Advocate). Sept. 20, 2014. Personal Communication. Creswell, J. W. (2003). Research design: qualitative, quantitative, and mixed method approaches. *California, Thousand Oaks: Sage Publications. Taylor, P. (Executive Director at GNH). Oct. 24, 2014. Personal Communication. This page was last edited on 30 November 2015, at 20:01.